INVISIBLE-EXPORTS is proud to present “Blue Blood Virus,” the third solo exhibition by Genesis BREYER P-ORRIDGE, and the first show of new collage work since 2009. Also included will be an on-site work in progress, in which BREYER P-ORRIDGE will be present at the gallery each week, inviting viewers to witness he/r process, and to join in an ongoing dialogue about he/r life and work. A legendary avant-garde visionary, Genesis BREYER P-ORRIDGE has spent literally a half-century interrogating identity: s/he was deeply involved in Fluxus and was a leading activist in Fluxshoe (Fluxus in Europe) in the 1960’s and 1970’s; the founder of COUM Transmissions (1969), the performance collective which spawned Throbbing Gristle whose sound s/he named Industrial Music (with Monte Cazazza) in September 1975; a central figure in the notorious 1976 ‘Prostitution’ exhibition at ICA London, which had Genesis branded by Parliament a “wrecker of civilization”; a Mail Art pioneer and collaborator with William Burroughs and Brion Gysin from 1971 until their deaths in the 1980s; and, beginning in the 1990s, the co-author of the now-mythic pandrogyny project, in which s/he and he/r now-late other-half, Lady Jaye, endeavored to merge both their genders and their identities—making their bodies the very vessels of the avant-garde imperative to re-imagine and reinvent as one “third being,” a Pandrogyne. One of h/er principal alter-egos and counterpoints has been, for decades, Queen Elizabeth II. BREYER P-ORRIDGE has felt a public rivalry with the queen since at least 1976, when the British Post seized mail art featuring defaced and disfigured images of Elizabeth, charging BREYER P-ORRIDGE with producing “indecent and offensive material”— charges which resulted in a suspended prison sentence and the maximum fine that could be imposed. After being forced to flee Britain, primarily due to the conflict of ideas between BREYER P-ORRIDGE and the Monarchy, s/he was, interestingly enough, invited back to play The Royal Festival Hall, the Queen’s venue, 10 years later. 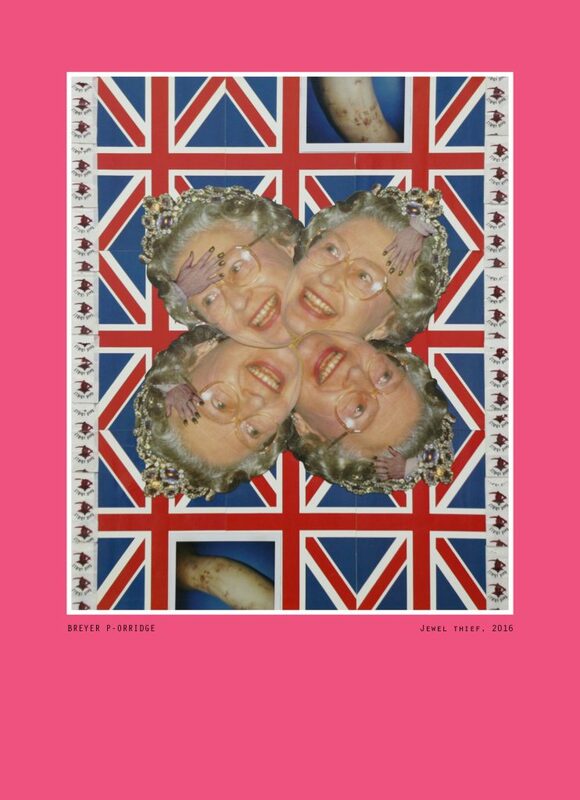 But the fascination goes back further, forming the basis of a deeply personal series of collages of the Queen and related British traditions that have occupied h/er since childhood. A rough contemporary of BREYER P-ORRIDGE’s parents, Queen Elizabeth II ascended the British throne when BREYER P-ORRIDGE was two, and has ruled Great Britain ever since—a symbol for h/er of all the narrow-minded backwardness of the British royal family, the country’s ruling class, and the oppressive postwar culture from which BREYER P-ORRIDGE emerged. But the Queen is also a figure of some sympathy and empathy to he/r, with her own strange, unstable relationship to her body and identity. As unlike BREYER P-ORRIDGE as could be imagined, the image and the figure of the Queen is nevertheless its own strange vessel, reflecting centuries of tradition and imagery, deep history and weird surreal contemporaneity, but also, inevitably, a screen for interrogation by the people she calls subjects.